Seborrheic dermatitis is a papulosquamous disorder with an inflammatory component. It is characterized by well-defined erythema and accompanied by overlying greasy scales. 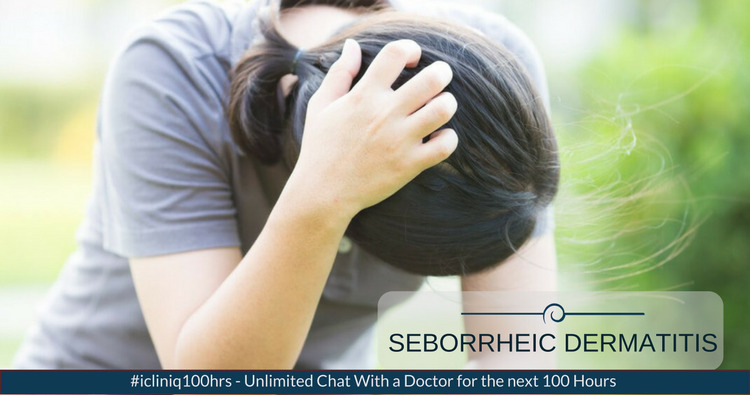 Seborrheic dermatitis will be seen over areas rich in sebum namely scalp, eyebrows, center of the face, eyelids, around and in the ear canal, upper chest, back and flexural areas of the body. In addition to sebum, this condition is linked to Malassezia, immunological abnormalities and activation of complement factors. The clinical presentation of seborrheic dermatitis varies with age. Intermittent active phases manifest with burning sensation, greasy, moist flakes and itching with reddish skin beneath the patches. It is alternative with inactive periods; activity is increased in winter and early spring with remissions commonly occurring in summer. It has a biphasic presentation in early infancy (within the first three months of life) and later in adult life (usually after third decade). During active phase, the chance of secondary infection is mainly in intertriginous areas, eyelids and postauricular areas. Candidal overgrowth is common in infantile napkin dermatitis. When an infant suffers from seborrheic dermatitis, it tends to form a layer on the scalp and is known as cradle cap. Clinical presentation of cradle cap includes yellow, greasy scale on the scalp and a thick layer of scale covering the entire scalp. The scale is often yellow to brown in color and with time, the scale becomes flaky and easily gets detached. In infants, this disease can also involve the face usually baby’s eyelids, around the nose or ears and it can also involve the napkin area. The incidence of seborrheic dermatitis is more common in medical conditions like HIV, Parkinson’s disease, epilepsy, alcoholism, etc. Diagnosis is usually done with the history of waxing and waning severity and by the distribution on examination. A skin biopsy is needed in patients with more than 90% body surface area involvement. Many babies develop this type of rash on their scalp and this condition normally decreases by 6 to 12 months of age. Till that time, to reduce the rashes the following things can help. Daily shampooing with baby shampoo will help in softening the flakes or scales. Once the scale start softening, gentle brushing will remove the scales. Infants napkin area involvement or in other body areas, these rashes can look like psoriasis or eczema or an allergic reaction. Each of these conditions require a different treatment plan. One should use anti-dandruff shampoo twice a week. If using one dandruff shampoo does not bring relief, then try alternating dandruff shampoo. Use the second dandruff shampoo for two days in a row. The active ingredients of dandruff shampoos are Zinc pyrithione, Selenium sulfide, Coal tar, Ketoconazole, Corticosteroids, Ciclopirox olamine, Salicylic acid and Sulfur. When using anti-dandruff shampoo follow the instructions on the shampoo bottle. Some require that you lather and leave it on for about five minutes before rinsing. Others should not be left on the scalp. It is best to see a dermatologist for a product recommendation. If shampoo that you are using has coal tar, then protect your scalp from the sun. One can do this by wearing a hat in outdoors and not using indoor tanning devices, such as tanning beds and sun lamps. Wash the skin frequently with 2% Zinc pyrithione containing soap. Scales should soften by wetting the skin thoroughly before washing and applying good quality moisturizer after bathing. Apply a tar containing cream and leave it for several hours before rinsing. Apply cream which contains Sulfur and Salicylic acid. Do not use any kind of occlusive cream like petroleum jelly to soften the scales as it may worsen the condition. Why do I have red spots of dry and irritated skin?